Of the many procedures that patients go through during general check-ups, medical exams, and hospital consults, a considerable few are hard to pronounce, and for some doctors-in-training and beginner practitioners in the field, even harder to perform. Ophthalmoscopy, the examination of the patient’s retina and other structures at the back of the eye, is certainly one of these complex procedures. But, as with any challenging task, arming oneself with the right tool is the ultimate key. Ophthalmoscopy, also called fundoscopy or the fundoscopic examination is a routine physical assessment of the structures at the back of the eye, collectively called the fundus. A quick and painless procedure, ophthalmoscopy makes use of a simple enough technique wherein the doctor shines a beam of light into the patient’s eye, effectively getting a close look at the arteries, veins, and a piece of the central nervous system of the patient. Ophthalmoscopes come in different types and variants, but all are simple instruments that have a primary source of light and various filters and lenses. In its inception, the process of ophthalmoscopy began as the solution to a simple question–why did the pupil of the eye sometimes appear black, and sometimes appear light? It has been almost 170 years since Hermann von Helmholtz’s invention of what he then called the Augenspiegel or “eye mirror” in the year 1851, and what he came up with then would become the blueprint for today’s modern direct ophthalmoscope. It’s working concept was simple enough–the observer’s line of vision must be on the same axis as the direction of the illumination, pointed towards the eye of the subject. According to Helmholtz, there were only three essential elements in his construction of the ophthalmoscope, namely, a source of illumination, a method of reflecting the light into the eye, and an optical means of correcting an unsharp image of the fundus. Since then, the direct ophthalmoscope as a doctor’s tool has evolved to a great extent, especially due to the transition from candlelight or gas lamp to incandescent lamp, providing an easier means of producing illumination. Though simple in principle, the traditional direct ophthalmoscope may seem a very complex gadget to the uninformed observer. As stated earlier in Helmholtz’ invention, ophthalmoscopes have three primary components–a source of illumination, a means of reflection, and a means of refining the produced image. The head of modern direct ophthalmoscopes consists of the light source, viewing aperture, and different lenses and filters. The device is turned on or off with a rotating knob usually found on the handle that also serves to adjust the intensity of the light beam. This is so that the light beam can be adjusted to provide the lowest illumination necessary to lessen pain or discomfort in the patient. Also, modern direct ophthalmoscopes carry batteries in their handles, but some designs may also be rechargeable. At the front of the device is a rotating dial used to adjust between various available filters for size, shape, and color, each serving a different purpose. The size of the light beam can be adjusted to large, medium, and small depending on the level of pupil dilation. The small light is used when the pupil is constricted, which is usually the case if the patient is in a well-lit environment. The medium-light is most-commonly used for the non-dilated pupil in a dark environment, and the large light is used if mydriatic eye drops were used to dilate the patient’s pupil chemically. With the filter dial, the shape of the light beam can also be adjusted to half light for cases where the pupil is partially blocked by a lens with cataracts; slit light, to examine contour abnormalities of the eye; and grid light, to observe relative distances of the structures or retinal lesions. The filter dial also includes color filters such as red-free light (which usually appears as green) used to improve contrast by making the retina look black and white; and blue light, which can be used to observe corneal abrasions and ulcers after staining the eye with fluorescein. Meanwhile, the focusing dials at the side of the head are used to select the strength of the lens by rotating clockwise for plus lenses and counterclockwise for minus lenses. The purpose of the lens bank is to bring the different structures into focus during the examination, as well as to compensate for refractive errors in both the patient and observer. Using a well-designed tool such as the traditional direct ophthalmoscope would require certain techniques for proper use. Firstly, the examiner must prepare the right environment where the examination shall take place, usually in a dimly-lit room. The patient must be comfortably seated, with enough room for the examiner to walk around him or her. Depending on the need, the doctor can also decide to administer mydriatic eye drops for pupil dilation. In preparation for the procedure, it is recommended that both patient and doctor remove they eyeglasses unless the patient is highly astigmatic, or the doctor is highly nearsighted. Depending on the eye to be examined, the instrument must be held with the hand belonging to the same side as the examining eye–the patient’s left fundus must be examined with the left eye and the right fundus with the right eye. Ask the patient to focus on a single point about a meter’s distance ahead. In selecting the best direct ophthalmoscope, the first thing to consider is product price. As a specialty instrument, ophthalmoscopes are sold at reasonably high prices in the market, but some brands offer lower prices than others, and in keeping within the confines of one’s budget, the price is an important factor. Buyers of ophthalmoscopes must also importantly consider the performance of different ophthalmoscope brands according to product reviews. How well does the product do its job? Finally, one must also look at the ophthalmoscope’s quality and durability based on what materials were used in its production. Higher quality products are sold at higher prices, and it is a smart buyer’s responsibility to check where economy and quality intersect. For an entry-level device at an entry-level price, the ADC Proscope Standard Oto/Ophthalmoscope Set is a good beginner’s ophthalmoscope that does its job well. It comes with 5 aperture selections, 19 viewing lenses from -20 to +20 diopters, rubber brow rest for comfort, and a 2.5v Xenon lamp. The bulb may not be as bright as other, more expensive brands, but its intensity is powerful enough to illuminate what is needed to be visualized by the examiner. For healthcare students and practitioners on a tight budget, this is the perfect first option. 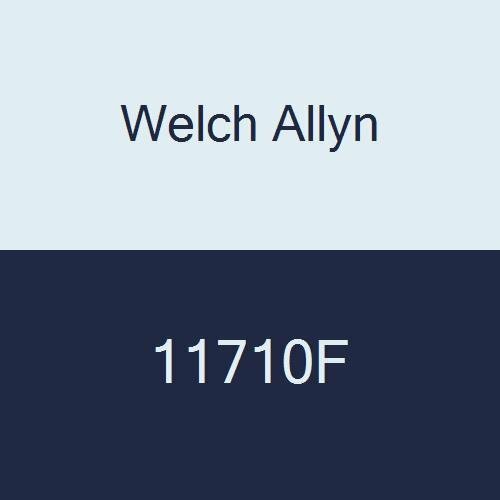 An even more amazing product from the same brand, the Welch Allyn Coaxial Ophthalmoscope gives the highest precision in terms of resolution when it comes to the fundoscopic procedure. 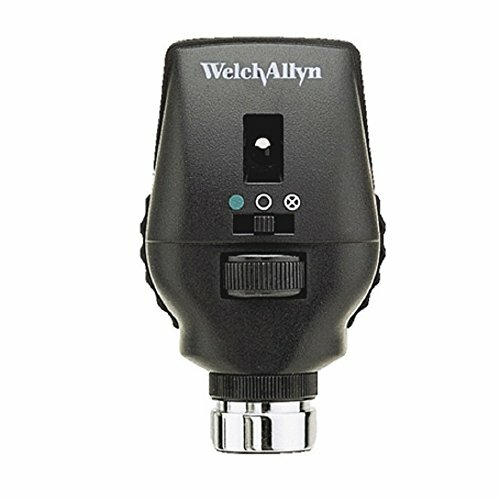 With a more improved Halogen HPX ® lamp illumination giving of 30% more light output, the Welch Allyn Coaxial Ophthalmoscope gives you all the light you need to see what you need to see in your patient’s eye. This product combines 68 lenses in single-diopter steps with a range of -30 to +38 diopters as well as 18 unique aperture/filter combinations.